To that end, MacCachren will be piloting the No. 20 Rockstar Energy/MasterCraft Safety Trophy Truck for the entire 2010 SCORE International season, adding to a busy schedule that also includes the Lucas Oil Off Road Series races. 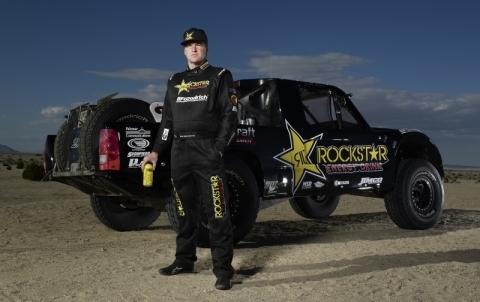 MacCachren’s all black Jimco-built Rockstar Energy/MasterCraft Safety Trophy Truck will be 21st off the starting line in the upcoming San Felipe 250, while teammate, Robbie Pierce will be the fourth Trophy Truck to leave the line in his own No. 30 Jimco-built MasterCraft Safety/Rockstar Energy Trophy Truck. MacCachren finished seventh at the first SCORE event of the season in Laughlin, Nevada, where only 28% of the premiere Trophy Trucks completed the course. “Jimco builds such a fast and reliable machine, and now that Rockstar Energy and MasterCraft Safety are providing me a chance to campaign my own truck for the entire SCORE desert racing season, I think that we are a real threat for the season points championship,” MacCachren stated following the race. “As our product line expands, it is only natural that our race team grows as well” explained MasterCraft Safety CEO, Robbie Pierce. MasterCraft’s latest products include a full-line of performance driving suits, fuel and pit crew fire suits, neck braces, helmet skirts, and elbow and kneepads for pit crew safety and comfort. Available in either SFI 3.2A/1 or SFI 3.2A/5, Mastercraft Safety’s performance driving suits meet and exceed all stated SFI fire protection requirements while providing a comfortable fit and design. Optional hidden-pockets and sewn-in elbow and kneepads make this the first race suit specifically tailored to the unique environmental conditions of desert racing. Their most popular race suit, not coincidently, is the Signature edition, which is the suit of choice for SCORE Champions like Rob MacCachren and BJ Baldwin. More information on MasterCraft Safety’s full-line of products can be found by visiting www.mastercraftsafety.com. The man can drive. It’ll be an excellent team..